It seems that although I have been busy engaging on social media, that I have not done a good job checking in with each of you at Feed Yard Foodie. I am in the process of developing a new weekly theme to carry through the winter; but have not had the opportunity to get it completely lined out in my mind. I hope to have this started next week. 2018 started with a video describing the Beef Marketing Group — who we are — and what we value. For those of you who wonder about the agricultural cooperative that I work for, this will give you a glimpse of the people and our focus. For those of you that like to read words instead of watching videos, here is a link to a blog post that I recently wrote comparing living space in a feedlot to New York City. Tagged as agriculture, agvocacy, Beef, Cattle, farming videos, social media, Who raises my beef? Managing a feed yard for 20 years inspired me to learn to identify and fill meaningful gaps. With thousands of animals relying on me each and every day, recognizing if an important gap existed between the care that I offered and what the animal needed was absolutely critical for good welfare. As an adult, I find myself continuously looking for gaps in all aspects of my life. I have found that when you look for them with the intent to fill them in a positive way, that it gives your life purpose. Over the past several months, many people have asked about my new job and what I do for the Beef Marketing Group. The short answer is that I work to fill the gaps. An extra set of eyes can be a critical tool for evaluating if and where a meaningful gap exists; and I work with my teams to figure out the best way to fill them. While I enjoy the time that I spend outside at the cattle feed yards the best, helping to create the plans/protocols that ensure good care as well as the communication tools to share our story also refills my cup. Our swim team mantra for this summer is “A goal without a plan is just a wish”, and I think that is true for any facet of life. Making goals is critical for improvement; but perhaps even more important than creating the goal is building a plan which holds you accountable to see it to fruition. I tell my athletes that no matter how good you are, you can always get better and I carry that same philosophy everyday with me as I go to work for the Beef Marketing Group. It makes for a good fit. Started by a small group of cattlemen in the late 1980’s, the Beef Marketing Group fulfilled a longstanding dream to create a team and develop cooperation with the end goal of improving beef quality in the meat case. 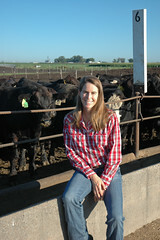 This multi-decade effort eventually led BMG team member Heather Donley to create the Progressive Beef program. 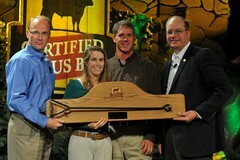 Progressive Beef’s three tiered focus concentrates on beef safety, animal welfare and sustainability. It provides the necessary plan to accomplish the goal. In the more than two decades that I have worked in the beef industry, I have never known a program better suited to finding and filling the gap in cattle care and resulting beef quality. Daily chore protocols come together with onsite visits from animal welfare consultants like me to ensure that we are doing our best every day; and that good cattle care is always the #1 priority. Yearly 3rd party audits ensure integrity of execution and provide verification of our efforts. It’s pretty awesome to develop the ability to find the gap, but it is even more rewarding when you work within a system that allows for you to help fill the gap in a meaningful way. It gives my life purpose and inspires me to greet every sunrise with the natural enthusiasm that results from knowing that what I do every day makes a difference – not just in the lives of the hundreds of thousands of animals that are cared for by my team, but also for the millions of people that benefit from the high quality beef that we all help to ensure is grown with integrity. How do you fill the gap to provide a sense of purpose to your life? When I made the difficult decision to close down my feed yard, I knew that I did not want to completely leave the beef industry. A couple of things have allowed me to continue to find my way, and it brings me a lot of pride to be able to blend them together to tell a true story of beef production. Cal, Tim and Jeff Miller live near Maxwell, Nebraska and we have worked together to grow cattle and make beef for about a decade. I was able to continue purchasing some of their animals to graze my grass pastures this spring and summer thus remaining an “active beef farmer”. This not only fuels my love for cattle, but it also provides great family times as my girls and I work together to take care of the animals. My job at the Beef Marketing Group opened the door to creating a new partnership this year with Roberts Cattle Company in Lexington, Nebraska. The Roberts Crew does a great job as cattle caregivers, and I know that they share my commitment to high quality animal welfare. Recently, the Lazy YN yearling steers moved off of my grass pastures and into the feed yard. The following two videos tell the story of the cattle and their caretakers. It is a story of integrity and dedication. It is an example of the real beef story. I have shared both of these videos already on Facebook and Twitter, but I know that some of you rely only on this WordPress site for a connection to our farm. For that reason, I am sharing the videos here as well. I would like to take this opportunity to thank all of you for sticking with me during my life transition. I am learning new things and trying to build meaningful skills; and I very much appreciate all of the support and feedback that I received as I started this new adventure. Tagged as Beef, Beef Marketing Group, Cattle, cattle life cycle, cowboys, farm, How are cattle raised?, Innovative Livestock Services, What is a ranch? My favorite farmer and I moved into our house early summer of 1997 when we made the trek back to Nebraska from New Hampshire. The building sits on the corner of one of our family’s farms about a mile north of town. We added onto it when my favorite blonde cowgirl was born, and built a large shop to complement the farmstead several years ago. As is the case for many people, our home has become more than just a building framework. It is a reflection of Matt and I and the family that we have been blessed with over the past 20 years. In my new role at the Beef Marketing Group, I spend time in a variety of feed yards working on the Progressive Beef quality management system. While most of my efforts concentrate on the five feed yards located in Nebraska, I do sometimes travel to Kansas. As I was driving home from a feed yard in Kansas Tuesday night, it occurred to me that a feed yard is like a home. Similar to my house, it has structure from both a physical and management standpoint, but the sum of its total parts is much greater than that framework alone. Each feed yard is a home — It carries a unique personality created by the families who work there. All of our feed yards operate under the Progressive Beef program. Just like the framework of my house, the required 42 Standard Operating Procedures build a healthy foundation. The accountability provided by the auditing process strengthens that foundation and verifies good daily animal care. It is an incredibly successful system and makes for a solid “house”. I truly believe that it’s people, in combination with systems, that create culture and atmosphere. What makes the Beef Marketing Group so successful is the combination of the Progressive Beef framework with the personal touch of the families that work in our feed yards. The blend of our program and our people turns the structurally strong house into a comfortable home. I prefer to live not just in a house, but in a home: a place that reflects my personality and core values. My girls would likely report that (at times) their mother acts similarly to a loving Drill Sargent. But, I think that they also would say that order is preferable to chaos, and that when everyone in the family plays an important role in maintaining the home that it is a pretty awesome place to live! I have been a believer in the system of Progressive Beef for years. It prioritizes the crew’s focus on the animal’s needs, and holds everyone accountable for their role on the feed yard team. The unique blend of both internal and 3rd party audits allows for a dual layer of accountability that leads to both teaching moments and continuous improvement as well as verification to our customers that feed yard team members provide the high quality animal care that is our trademark. Tagged as Beef Marketing Group, Feed yard, feedlots, progressive beef, quality assurance, What makes a house a home? Monday afternoon I spent time in a BMG feed yard before heading to Lincoln to the University of Nebraska. That evening and Tuesday morning found me hanging out with graduate students in the College of Agricultural Sciences and Natural Resources. Tuesday afternoon I lectured on campus before driving back home in the evening. It was a fun couple of days on the road, and I always find that I learn something every time that I leave my farm. The topic of my lecture was “Sustainability, Responsibility, and the Art of Balance”. Sustainability provides one of the biggest buzz words of 2017. Responsibility often finds it’s way into current conversations about food production. The Art of Balance applies to both the discussion of agriculture’s needed commitment to people, animals, and planet; as well as my own personal agricultural journey. I really enjoy college public speaking gigs. Our students are our future and if I can find a way to inspire them and aid them on their journey, then I am playing a positive role which refills my cup. While on campus, I fielded many questions about closing the feed yard and my new life and job with the Beef Marketing Group. My answer generally started with the words “I am finding a new normal…” When you make a life change after twenty years, things look different on a daily basis. Likely the best thing that I can report is that I have regained the natural optimism that makes me Anne. This reclamation comes from attaining a better sense of balance in my life. A healthy commitment to exercise that improves both my mental and physical fitness. A work environment that leaves me feeling as though what I do is meaningful, while also allowing me the freedom from worry at the end of the day. Our Dartmouth College swim team shirts boasted the saying Pursuing Excellence across the back. It provided a good fit for me as I have always felt the need to raise the bar. Managing a feed yard for twenty years taught me the critical importance of a good team. When you care for thousands of animals, it is impossible to do the job without the help of others. Because the welfare of those animals is dependent on you, anything less than excellence in care is unacceptable. A willingness to unselfishly give your all while simultaneously inspiring others to do the same allows for success. Last week we shipped the final pen of cattle from our feed yard, and I officially started a new journey. I joined the team of Innovative Livestock Services and the Beef Marketing Group. 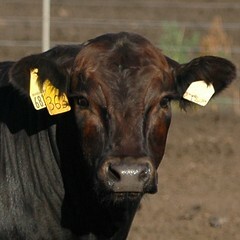 BMG is a cooperative of feed yards in Kansas and Nebraska that operate under the Progressive Beef QMS. My feed yard spent the last four years as a member of this coop and, during that time, I discovered a group of kindred spirits. Anyone who knows me can read that statement and see what a perfect fit this opportunity is for me. I will play a dual role working on quality assurance and communications projects. The quality assurance role enables me to continue to work to improve cattle welfare, and the communications projects allow me to empower my voice as an advocate for agriculture. As for Feed Yard Foodie, look for the usual weekly ramblings on our family, our farm, and my new adventures as the Burkholder clan continues on the pursuit of excellence.